I’m on a mission to find a handling course that I like. There’s plenty of handling courses out there it seems, but I’m not sure any of them suit what I’m after. I tried to find a database online of all the people offering online lessons but such a thing doesn’t seem to exist. So here we go. Online courses for agility-related things. Online classes, long-distance learning, whatever you want to call it. Feel free to add any you might know of that I’ve missed, or fill any info in that I get wrong. Please note: The information listed here is my opinion, based on either what I’ve read/heard, or having done the course myself. As this is my opinion only, information may be missing or incorrect so of course do your own research before joining a class and form your own opinions. I do not guarantee that the information below is correct and is based on my opinion of that course/trainer. Courses are listed in no particular order. Orenius/Emanuellson – More Euro-style courses with lots of twisty-stuff. Also got good reviews from a friend with different ways to handle sections and the reasons why. I don’t think they actually run courses through here any more but have more like a ‘private class’ option. Shape Up Dogs/Justine Davenport/Jessica Patterson – I worked through their Foundations course, which was pretty good but not very ‘foundation-y’, eg. you wouldn’t want to do it if you were a beginner. A focus on ‘trained cues’ rather than ‘natural cues’ in handling, from what I got out of their seminar. Looks like they do some challenging courses to work through. Martina Magnoli Klimesova – holds classes throughout the year on a few topics, mostly handling and jump skills. The classes are run through a Facebook group with videos, and she gives good feedback. OneMindDogs – Not sure this belongs here specifically since it’s not a course, per se. As in you won’t get feedback and there’s only occasionally sequences to try.. there’s lots of good videos on how to do and train their moves and turns and a bit of info on when to use them but I find that part of it lacking… I want to know how to handle specific sections and why. No chance to see other participants’ videos or look at their feedback etc. If that’s something useful for you (I tend to not do that). Zeljko Gora – An interesting ‘course’, as Zeljko sends you a new course map via, you set it up and run it when you have time, and he sends you feedback on what went wrong or how to tighten up your times, as well as lots of handling options to choose from that you mightn’t have considered. You can then run it again, get a little more feedback and a new course. I’ve really enjoyed working with him and like his feedback but I think because it’s not a “week by week” or “fortnight by fortnight” course, I’m pretty slack at setting something up regularly. And he doesn’t mind, but works to your time. 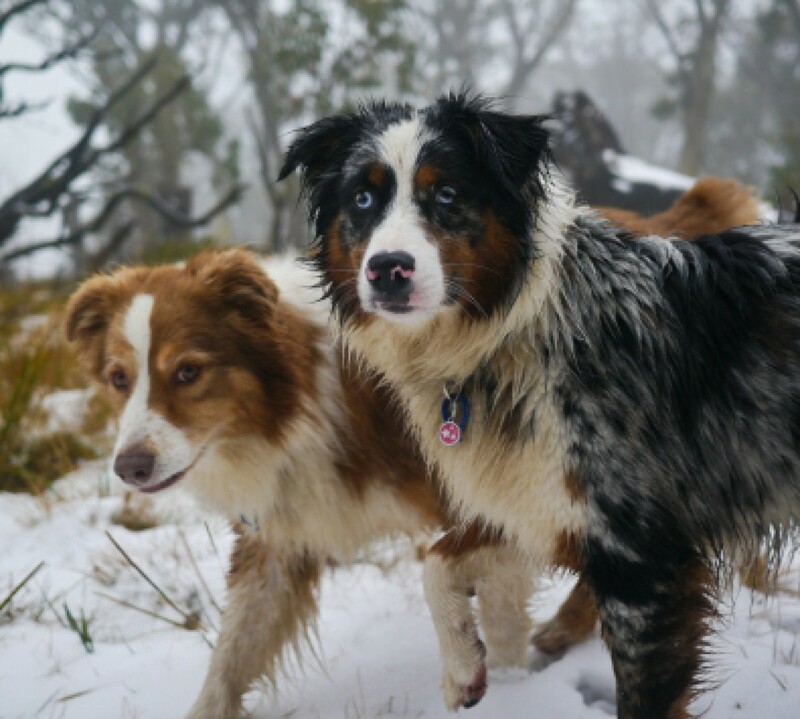 Drage Dogs – run by Niki Drage, who is an Australian OneMind Dogs coach. Has monthly courses that focus on a particular OMD handling manoeuvre. May also do “private” lessons. I did lessons with Niki for a while and really enjoyed them. Fun, challenging courses, with a good eye for providing feedback on handling. Megan Bell/Epic Agility – Megan is an Australian handler from WA. I’ve done a few seminars with her, and one of her online handling classes. Each week (or fortnight?) focused on a specific handling move – front cross, blind cross on the flat, etc, and there were a couple of courses within the one setup, to practise the move. Megan’s feedback was timely and helpful, she’s personable and has a good eye for how to improve. Not sure if she’s currently doing classes but does run them occasionally. Q-Me/Dave Munnings – From the UK. Presents lessons as a series of modules that you can buy. I signed up for the tunnels class and you get a video explaining what you’re meant to do – I’ve only done the first few lessons so far, I’m assuming that later when there’s sequences there’ll be course maps. You can join his Facebook group once you’ve signed up and get feedback on your videos that way (which I didn’t do). Reasonably priced. H360- S. Garrett’s project, I won’t write about it much because if you haven’t heard of it I’m sure you soon will. Everybody down here in Australia loves doing it, but I’m, personally, not interested, especially since according to her e-book, if you train your dog to wrap a pool noodle it will magically begin to love agility. Lumen thinks wrapping things is one of the dumbest things you can do. But hey, people are having success with it, and I guess for $1000, you’d want to. Daisy Peel – Plenty of courses here, not just around handling. I haven’t done any personally because I don’t necessarily love Daisy’s handling style, but she seems to have a pretty good deal on a year’s worth of sequences & handling options (no feedback I don’t think) so that’s interesting. Probably useful for US/Australian courses rather than Euro-style courses, which is a nice change. Ultimate Agility/Greg & Laura Derrett – Haven’t done their courses and don’t know anybody who has. Greg Derrett’s system used to be hugely popular where I live but has now been replaced with H360. Agility U – I find this one interesting because they have lots of different people holding lots of different classes on things, but the concern I have with it is that I don’t know the handlers/trainers and I can’t seem to find videos of them running, and I don’t want to sign up for a handling course if I don’t know if I like their handling. All Star Agility/Lori Michaels – Says she does online courses and an online friend of mine does them with her and really enjoys her feedback but I think it’s a matter of contacting her and is run through a Facebook group. Zsofi Biro – Seems to have an option to contact her for one-on-one long distance coaching for whatever you want to work on. Jenny Damm – Looks like she has an option where she’ll send you a course to set up & run, then you send her the video & she’ll provide feedback. I suspect they’d be twisty Euro-style courses. Polona Bonač – Currently has a class focusing on Speed, motivation & play that we did and it was awesome. I think her class is probably closed for now but she might run it again. Ann Croft – Seems to have a strong focus on jumping skills, also has a weave skills course. Awesome Paws – Currently more of a focus on jump skills by the looks of things. Seems to have self-guided & feedback classes. Katarina Podlipnik – Has a speed & motivation class plus some individual learning options. Dawn Weaver – Has a few different things, including jumping, but also training contacts. Agility secrets– Claims to have plenty of info from various trainers about various things, but not sure of the quality/quantity as it’s all a mystery. Clever Dogs Agility – Currently offering a Start line stay course, with plans to do a 2o2o course. Fenzi Dog Sport Academy – Not just related to agility, covering a whole heap of different things from general behaviour issues (motivation and play, prey drive, focus, etc), to obedience, to nose work, to a variety of agility things and more. I’ve done two of their courses as an auditor and wasn’t that into them personally, but that could be because I really need to feedback and impetus to keep up with lessons that you get when you have a working spot in a class. I’ve linked to the agility page but you can explore from there. What a great list Em? Having been to the seminar Zsofi held here in Sydney last year I can highly recommend her style of handling and her wonderful feedback. She picked up things that I did in my handling that no one else had picked up on in the 4 years we have been training (particularly in relation to why we might have a bar knocking issue). I’m not doing the 1:1 with her but have a group of friends that are and they are loving it. A local option…. yes an Australian one! Is Stacy Richards at CuteDogs. Stacy represented Australia last year at the WAO in Italy. She also helped organise Noora from OMD to Australia last year and this year is running a series of seminars here in Sydney with Dyson Beasley from NZ (who cleaned up at the Australian Nationals last year). She appreciates the Euro style handling and has trained it but is aware it has its place within a series of tools for the Australian courses (because we aren’t exactly seeing the windy Euro courses here yet, at least not in NSW, but a hybrid version of what we are used to with some Euro backsides etc put in as challenges). She has 3 levels from Foundation Groundwork through to a Handling 101 which is more advanced. We have just finished the Foundation Groundwork and will be doing the next level Building Blocks shortly. I can highly recommend Stacy with regards to well thought out exercises and explanation, timely and thorough feedback and creating a wonderful supportive community. I completely forgot Stacy! I’ll add her to the list. 🙂 I was going to do one of her courses as you know but having had a look at the videos I felt they were a bit basic, and although Handling 101 probably would have been great, she gave me the impression that you had to have done BB first. Hi Em! We’ve got a few cool new classes coming too! With plenty of feedback and fun ways to look at some of the nuts and bolts. Tammy’s Start Line Stays starts soon! Also Martina Magonoli from Chezch Republic started brilliant handling lessons recently! Zeljko’s course can apply to standard international/Masters Australian course very well, not too difficult, and always have some challenges that gives us training recipe! He teaches how to be “always” in front of dog to keep the fastest dog’s speed, and show how to create nicest dog’s line, We started understand that what handling is the most suitable for me & my dog. He explains so much details with some humor, Yes, He is very friendly 😀 In the future, I would like to take “Daily Life Lesson” class with him. It sounds wonderful, This class focus on daily stress, pulling, fear, aggression, motivation etc. o/e online course, Jouni’s knowledge of dog training is enormous. He has always provided me “the longest and detailed explanation ever” since I started online course, with such a friendly and heart warming comment. Not only handling, he focus on motivation, tempo, line, flow, connection very much. He helped us so much for motivation and connection. When I took Daisy’s class back in few years ago, there is Feedback or only Auditing options that you can choose from. Personally, I think her training courses were very close what we do in Australian. Her video explains so well, very good resource. Australian.. I think Nikki started private online lesson recently. Her structure is the same as Zeljko, she design course for your agility space and equipment, then let people to handle it fast – she will provide feedback, and student will try again, followed by her comment. Thanks so much for all your info, Emi. I’m going to see if I can add a “hover over for more info” link to put in some additional information without cluttering the page. Zeljko’s course sounds awesome – maybe it will be something to do with Loki when he’s a bit more experienced. I’m sure Lu could benefit too but because of how she is, I never want to do too much with her so trying and retrying sequences wouldn’t be that fun with her. If I end up doing it with Loki I might run Lu on those courses too. And I’ve just been in touch with Niki and have set up private online lessons. Very excited and can’t wait to start! Thanks for that great list! Regarding Fenzi Dog Sport Academy: I did four courses at them at different levels. If you need feedback (which I do!) I recommend doing the classes at gold level. For me personally bronze and silver is not enough, because you don’t get feedback (bronze) or only can ask questions via the forum (silver). At gold level you have to do homework (which is great for me) and send in video that gets commented.